Survey Analytics conducted a webinar on January 3rd, 2013 entitled, “How to Conduct Your Own Retail Audit.” A do-it-yourself retail audit gives you real-time intelligence on the retail environment. What follows is the text of the session up to the Q&A portion. At the end of this post you can find the webinar video and slides. This webinar is how to conduct a retail audit. My name's Andrew Jeavons. 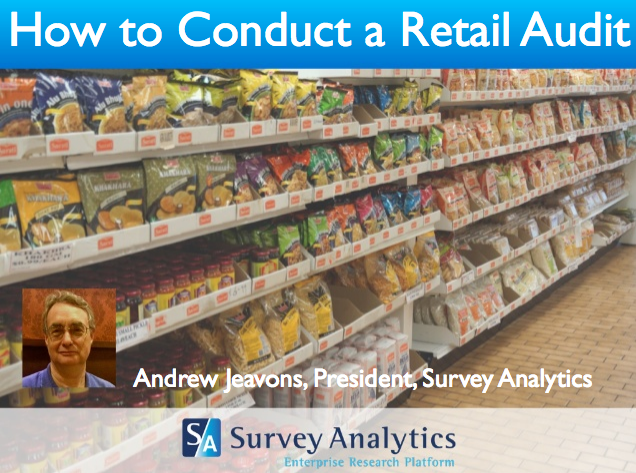 I'm the president of Survey Analytics, and I'm going to be trying to give you some insights into the procedures for retail audits and the technology involved. First of all, we're going to go through a little bit of the principles of a retail audit of what it's supposed to be. Then, we're going to do a technology demonstration showing you what kind of technology we've got. And then, we will be happy to answer any questions that you have. What is a retail audit? A retail audit, as the name implies, is the study of a selected sample of retail outlets. You may do this continuously, there's good reason to do this. You might do this discretely. Really, you're looking at your retail environment and trying to work out, what's going on? And if you're trying to improve that environment, if you're trying to catch where there are some problems, if you're trying to look at how the retailing environment fix those problems, you need to be doing the study continuously. Of course, there are lots of issues with a continued study. Not least, the costs of it and that's something that for each company has to be sorted out very carefully, obviously. But the point is, unless you carry them out, you're not going to really be able to see your environment improve. If you want rapid improvement within the environment, the name implies that you should do the audits relatively frequently. Now, if you want to see improvement over a two-month period, you should probably be doing an audit at least once, or indeed, twice a month just to monitor the fact that things are improving. Asking for improvements over a short time scale and not monitoring them, just really leaving it to chance Unless you can track the progress of the improvements you want, you're just simply not going to be able to see them. A discrete audit, which implies that you do a set of stores every now and again, has its uses but again, the point I think of retail audits is to continually monitor the retail environment, catch problems, and try to push through or enhance improvement in that environment. What's the goal of a retail audit? The goal is to monitor products in the environment. Now, they can be your products, they can be your competitors products, which are often very much as equally important. It's also to monitor compliance with agreed procedures and standards. You might well, as is very common in a lot of the fast-moving consumer goods environments, have certain standards of shelf placement of the product, placement of promotional materials, of the availability of ancillary materials, or maybe there's some equipment that needs to be placed in your retail environment. All those kinds of things need to be monitored. While the retail environments may state that they're doing these things with the best intentions in the world, lots of problems can occur whilst things get translated into the field, into the individual stores. And this is very often a huge motivator for performing retail audits-- that is, that you won't be able to see that those agreements that you've made, those standards that you've agreed upon are, in fact, being upheld, and implemented in the real world. A retail audit is, after all, a survey. As with any survey, you really don't want to make it too complicated. There is a trend or habit within surveys to make them long and complicated to capture a lot of data. The truth of the matter is, if you have a long complicated survey, you are compromising the data quality. Even if you have people who are very motivated to fill out your retail audit survey. They could be your sales managers or some other sort of management. Even they will make errors or have a reduction in data quality if the survey is too long and complicated. And when we had paper surveys that really wasn't an issue, because there was only a certain amount of paper that people could carry around. There was only a certain amount of skip logic that a person could actually administer themselves. Now that we've become electronically based, all those issues go away. You could easily have a 300 question survey. On a paper, that would just be beyond believe. It's too difficult, but you can easily do that with the technology. But that doesn't mean that you should. There is an argument that says having a short survey that's easily administered that will collect accurate information, is a lot better than the longest survey. That while you might think you're getting more information, the accuracy is compromised because of the length of the survey. Quality of data is critical in any survey, and particularly, in retail audits where you're going to be making business decisions directly based on that data. And there is a question as to whether mystery shopping, that is sending unknown people into retail environments and asking them to fill out a questionnaire about the environment is best. And I think it's a good argument that says, we really need somebody who's in your business environment who understands what they're looking for, to pick up on things that an anonymous mystery shopper may simply not see. And again, we go back to the motivational aspect. Somebody who is in the business, who has a vested interest in the business, has a much higher motivation to fill out the survey correctly than somebody who's being paid in dollars per store, and really just sees it as a job to get through at the end of the day. That then, again, comes back to the economics of the retail audit, can you tie up your management staff in doing the audit. That's just a question that companies have to answer on an individual basis. But mystery shopping, while it allows you to relatively easy cover a lot of locations, which may be very helpful to you, does have the problem that you're getting what you pay for. You may have people relatively low in motivation giving you what you regard as critical information and that can be a problem. Now, as technology has advanced, we now have a lot of smartphones, we now have tablets, we have some new data types. We have images, we have video. All have the potential for sound and these give us a lot more potential these days to capture real world data, which is actually what a retail audit [INAUDIBLE]. I'll talk about those in a little bit. The critical factor is what devices will be used to conduct a retail audit? Now, connectivity is also something that you need to address when you're thinking about it. How do you get the data back? How do you get the data back to the servers where it can be analyzed? There are two ways, tablets and smartphones. You can use a Wi-Fi network. Now, it's true that most retail environments, somewhere, have a Wi-Fi network. But the process of getting hooked up to it would be fairly arduous. And you don't really want to have somebody spending a lot of time dealing with technology issues when they are in the store to carry out a survey of the store. One alternative is to collect the data, as we say, offline. That is you can collect it on the tablet or the smartphone. And then, you can return to a known location where you know the Wi-Fi connectivity works and upload the data from there. And this can work very well, because the cost of devices that connect to the cellular networks-- and you may well have 20, 30, 50, 100, 200, maybe hundreds of devices-- is significantly more than devices that aren' cellular-enabled, in particular when you look at iPads and Android tablets. An iPad that has cellular connectivity costs a chunk more than one that doesn't. And you're going to be saving many 10s of thousands of dollars, perhaps, not having that cellular connection. The other alternative, obviously, if you have got those kinds of devices, just use the data networks. This can work very well. There are locations where you will hit dead spots, and again, you need to think about that. If you can't get the cellular network going, you need to have some way of getting to a Wi-Fi network or a cellular network that works. In the main, from what we've seen, in many ways, the safer way is to have Wi-Fi enabled devices where you can connect the data in an offline mode in a retail environment, and then get to a known environment with a known Wi-Fi environment, and then upload the data. This isn't to say it isn't possible using the data networks, but you still, even when you are using the data network, you may have the issue of no connectivity and that just complicates matters. So what exactly are you going to use? Tablets. Well, we've got the new small form tablets, the 7-inch tablets. We've got the standard form ones, like the iPad. They have a good screen size. They're easy to see. They might feel heavy after a while. If you're going around and spending time carrying a standard iPad around from store to store and spending several hours doing that, it might be something that gets a bit unwieldy, but there are cases and holders that can help you do that. It really comes into that environment of ergonomic usability. The small tablet is slightly smaller screen size, much easier to handle, and, of course, they're a lower cost, and particularly, that's the case when you move to Androis, tablets like the Nexus, which is a very good little machine and costs a lot less than an iPad. And again, when you've got hundreds or maybe thousands of these machines, that's a significant factor. Smartphones. Well, they're a small screen size, and that is an issue because you can't have complicated questions. You really shouldn't have them anyway, but certainly with a smartphone, you've got a restriction on the screen real estate. The advantage is perhaps, that a lot of your staff or people who you want to execute the survey, already have them. The penetration of smartphones in the US is very high. Most people will have an Android or an iOS device, so you don't have that cost factor of having to provide them. You do then have to work out all the issues of data connectivity and those types of things. The big disadvantage is really, again, it's a small screen size. And, that again, is a problem when you want people to use these machines for hours and hours on end. And this comes back to making sure the survey fits the device. If you are designing a survey that's going to be used on a smartphone and tablet, it has to go to the lowest common denominator, which is the smartphones. And smartphones and not tablet. Just because it looks real good on your iPad, doesn't mean it's going to look good on an iPhone. The screen is just so much smaller. And again, in both these environments, the more concise the better, long preambles and questions, do not use. That can affect your data quality. We talked a bit about new data types. We have images, very easy to collect. Now, you can take some great pictures, very useful to document any aspect of the retail environment. You can accurately assess store placements of products, you can go back later on and score how well products are placed and what you think about the displays. It doesn't have to be something that's done in the moment when you're in the store. It does allow an objective measurement in the improvements and degradation. It's not just a weighting scale of how well thing are placed and how nicely things look. It is something where you can look over time and see changes by comparing images. But, the issues with images, of course, is scoring an assessment after you've collected the image takes time. It takes administration. But it does give you much more accurate data. You really can have a metric that you can look over time and see how things have changed in the environment. Video, all the properties as images, but you can capture a lot richer information. You can perhaps, monitor how people interact with the displays, which you can't really do with the static image. It gives you that kind of snapshot of customer behavior, traffic if you stand there for a couple of minutes, some video of the aisle and see what's going on. That data could be very valuable. Again, the issue is that you have to analyze the data. Analyzing a couple hundred videos is a significant task, which you will get significant data out of that. And I do think that investment in analytics, it always pays off. We've gone from an environment where it was hard to get these kinds of objective measurements, say 10 years ago, now, you can get them using new technology. And I think more time spent on analyzing these objective measurements of images and video is really well spent. We can also record just the sound. You may want to, for various reasons, check out what the acoustic environment of the store is. You can listen for announcements, the noise, those types of things. You could even be asking customers what they think of the store and you get a snapshot there. And again, that kind of information can be very useful. It's my experience that senior management will often be very interesting to hear the snapshots of what people think, and it really does enhance the kind of data that you collect. Now, obviously, in a retail environment, one big data item is bar codes. And technology now allows us to scan bar codes. And obviously, this is very useful in having an accurate data point of what items are on the shelves rather than somebody taking a picture and it being hard to discern exactly what package size there is or what types there is, you can go through and scan the bar codes. The actual bar code can either be resolved in real time, that is when you're in the store, if you have connectivity the system can go ahead and collect that bar code information from a variety of different sources. You can even have your own source, if you so desire, or you can have that resolved later on. It does give you definitive information about the product quickly. It gives you exact information. It gives you consistent information. It's not really dependent on how well someone can fill in a survey of saying what color package size is placed in what point of the shelf, you can scan the items with a bar code, you've got the information. Let's talk a little bit now about all the possible sorts of data you can to collect in the survey. You can look at the coupons and promotions that are available. You can look at the merchandising and presentation of the products, the conditions of the store, inside and outside, often an important issue with consumers. You can gather metrics about staff and the training of the staff, availability and display of the products. You can assess service, the speed and quality of how long it takes you to check out, how quickly it takes you to get a price check, how many people are around to answer your questions about possible product, all those things can be part of a retail audit. You can look at the inventory that's available, any specialized equipment in the environment, if it's an environment where there's a drive-through, you can also do assessments of traffic on that there, taking pictures or video, seeing the kind of traffic you're getting. You can make an assessment in the kind of customer that are in your retail environment. And for some products, it's important to look at what kind of safety standards are being enforced within that retail environment. And the most important thing that you can do, particularly when you're conducting continuous studies is to standardize on the data. If you do not standardized on the data that you are collecting, you will not be able to do meaningful, longtime comparisons. There's always a temptation with any sort of continuous studies to add certain questions at certain points in certain instances of the study. While that can be done, it's important to remember that the data you get the standard from you can call perhaps, wave on wave of these audits, is the same. If you are not standardizing on what data you're collecting, you're really not using your resources and revenue effectively when you're conducting this audit. We talked about earlier, that a retail audit being a kind of survey, and of course, then there are sampling issues. What kind of stores are you going to sample? You could do by territory and sales regions, which is very often the kind of sample that people carry out. That they are wishing to monitor their own retail environment. You can do by vertical, by types of stores. Liquor stores, you go and look at all the different liquor stores. You might go around and look at all the different supermarkets, not just your own stores. And as I said, you're looking at competitors stores, seeing what differences there are between your stores and your competitors store about the product placement and about the retail environment. Random, as the name implies, is any store. You pick them on a random basis. That may be possible with some product lines, with others, possibly not. Again, if the audit is done on a continuous basis, the form of sample that you use should be the same. Otherwise, you're not comparing apples with apples. If you're comparing different samples between different phases of the continuous study, you're not going to get meaningful data. And that's just the general principles of any survey. When doing surveys, you want to compare them, which is essentially what's going on in a retail audit. You have to have the same stuff. I just spoke about, a bit before, who collects it? Is it an expert? Someone who understands the business space environment? Expensive, but data quality may be higher. Somebody like this may have intrinsic biases. They may have a habit or something in their training or their experience is going to make them look at certain aspects more critically than others. That's something very hard to avoid, all surveys are biased. Or you could just basically hired out help, someone hired to carry out the survey, along the mystery shopper line, perhaps, or somebody that you hire and train up. Cheap, lack of quality of data may be variable depending on the training. You've got to monitor that very carefully. And lack of knowledge may inhibit data quality, that's the reverse effect of somebody who's an expert. If they really aren't trained in that kind of retail environmental or the kind of products that you have, they may not be able to pick up on some things that are pretty important. It could be really important to you, it may not be viable to train them in all those things they need to know. Again, you've got to be consistent. The effects that people gathering data have on the data are real. Interviewer effects are real. This is a good example. If we have an expert versus somebody just hired to do the job. Being inconsistent with collection methods, again, can compromise your data. If you do one set of studies using internal highly-trained resources, such as somebody who's an expert, and then the next retail audit you carry it out using people who are essentially you've hired or are mystery shoppers, you're compromising the data of the audit. You're really degrading how useful it's going to be for you. You have to make a careful decision about how you collect the data. Now, if we go and think about what kinds of questions you're going to ask on the audit, most usually, you're looking at the kind of scoring or rating style question. A one to five scale. You could say, floors are clean, rate this on a scale of one to five, one being the worst, five being the highest. And then the scores, your one to five scale, they are very often summed up and set a percentage score for pass/fail audit. So you might want to say, well, I want people to get 80% at the highest level, so if you've got 5 questions or 10 questions and they all score five, you want a score of 40% or higher as the sum of the questions to say that you've passed. That's in the criteria, the set of criteria, that it's up to you to decide. But it's usually a good idea to set some sort of metric like that. You want to have an aggregate score. It makes it easier with reporting. It makes it easy to summarize the data. Yes/no questions, again, you set a level for how many are fail and score accordingly. In general, the retail audit will want to score the environment on an aggregate score. At the end of it, you say, OK, this environment's got an 80% or a 60%. And then that implies actions that needs to be taken to bring those scores up. Obviously, the whole point of doing any sort of survey like this is reporting and analytics. You have to think about your audiences that you're going to address. It might be store region managers. We might want certain regions to see the scores of their regional stores, very common in this sort of research. Higher up executives might want to see things on a national or a higher level of granularity. They want aggregation of the scores. And again, when you're looking at that executive environment, they're going to want to drill down on the data where they can. And we have some solutions that are available to enable all those audiences to be addressed. Thanks everybody for their time. As I say, if you do have any questions, please feel free to contact us, and everybody have a great day.